Sport is central to the lives of many Australians. This isn't simply a reference to participation levels, but the importance of sport as a social institution. Organised sport, from the elite level though to local community clubs, is a part of a complex social ecology that is an important part of our lives. This means it is vital that we acknowledge sport as a crucial learning place for gendered relations. In our research, we examined how sport can be used as a "hook" to start conversations with men and boys around domestic violence and respectful relationships. Community leaders and role models can be harnessed to instil healthy attitudes in young men. In their absence, the sporting field can serve to sustain the drivers of violence against women and girls. Working with Power Community Limited, the community arm of the Port Adelaide Football Club and the NO MORE program in the Northern Territory, we examined the effectiveness of primary prevention family and domestic violence programs aimed at men and boys in distinctly different environments. Port Adelaide's Power to End Violence Against Women program targets year 10 boys, primarily in metropolitan schools across Adelaide, while the NO MORE program, with a focus on football clubs, works across the NT, with an emphasis on remote Indigenous communities. Sport is a social glue and a focal point of activity for many families. At a much larger scale, our very sense of nation and what it is to be "Australian" is often defined through sporting prowess. Sport also feeds into an Indigenous sense of manhood, so long as their indigeneity remains unthreatening to the broader Australian community. Outward displays of indigeneity that do not conform are loudly rejected—think former AFL star Adam Goodes and his "war dance". In the focus groups for participants from the Port Adelaide program, one student powerfully stated: "Men are taught not to show emotions … or you'll be cut from the crop." However, we were also able to show that positive messages "stick". Year 11 students, who had taken part in the program the previous year, recalled content on respectful relationships and positive bystanding. One student was adamant that: "…after [doing] this course it is wrong not to step in." The use of high-profile footballers assisted with the retention of key messages. Students and teachers universally saw the value in having AFL footballers contribute to the delivery of the program as a mechanism to "cut through" and get the attention of participants. The NO MORE program works with a range of stakeholders, including men's groups and football clubs. 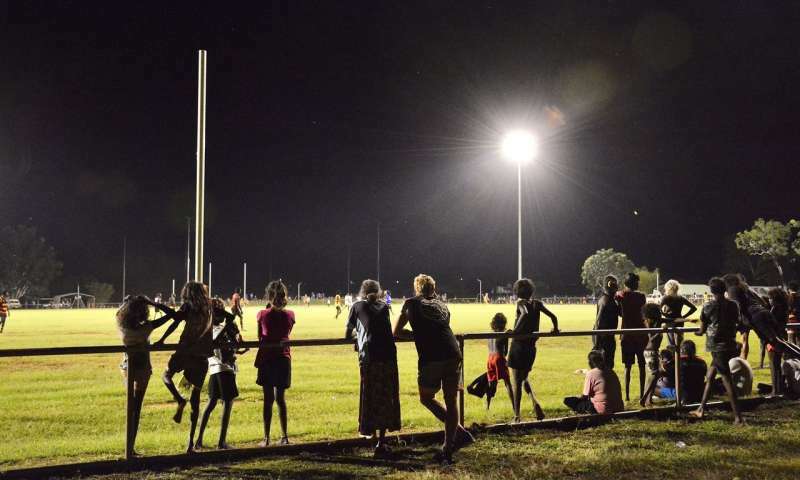 Indeed, on the Tiwi Islands, a men's group member declared that "It's Aussie Rules or it's nothing". Charlie King, the founder of NO MORE, says this is indicative of every remote community that he has spent time in. For Charlie, an ABC sports commentator and Gurindji man, you will always "find small group of men who want to make a difference." In Ngukurr, in southeast Arnhem Land, we observed a NO MORE march that snaked its way through the community before gathering on the football oval. There the community came together to link arms as a show strength and connectedness to say "no more" to family and domestic violence. While the beginning of a community movement and activation could be sensed, there was an understanding that this would take time. As one of the Elders who planned the event noted: "…you're looking at generation after generation. This is a generational plan … because you might be a father and you might be a mother later on, it's about what sorts of seeds you're planting." The comment is not dissimilar to one made by an AFL player involved in the Port Adelaide program: "The purpose is to impact the generations … getting the younger generations to know that [violence against women] is an issue and not to tolerate it." These are certainly gains, but care needs to be taken to ensure that the programs are not simply activating an ethos of "real men don't hit women". Such a view, while advocating nonviolence, is one-dimensional and limited in that it arises from the very norms and attitudes that sustain regimes of gendered violence.